Adding a range hood to your kitchen is a great way to make the space feel fresh and new. A range hood is a canopy that is installed above your stove with a vent enclosed. Using this fan, the range hood removes unwanted air compromised by what you may be trying to cook and moves it outside. Range hoods are useful devices to have in any kitchen even if it is not a splashy and impressive buy like a backsplash. Purchasing a range hood is however a practical investment for your kitchen, and one you will soon come to appreciate for several reasons. Make a smart investment and make your kitchen even more amazing than it already is by purchasing a range hood to help keep the air clean. Often time cooking involves dealing with smoke, steam, and grease which can all be dangerous to deal with. Range hoods can easily deal with these obstacles by helping to remove them the best that range hoods can. They also have the added benefit of helping to cut down the amount of carbon monoxide that could potentially be present in your home. In addition to keeping the air clean in your kitchen with ventilation from a range hood, you will also be improving the lighting situation in your kitchen. Equipped on range hoods are lights that can help you see what you are cooking more clearly. This extra lighting provided by your range hood will be especially useful when cooking raw meats as you will be able to better see and tell when they are fully cooked and ready to be eaten. 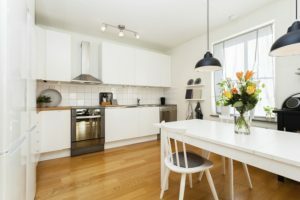 A range hood will also be useful for cleaning as you will be able to see dirt and grime that has been hiding in front of your own eyes but is only now just seeing the light of day. If you are someone that likes to see a more financial return on their investment, be excited to know that you will get that from a range hood. If you add a range hood, any team of kitchen designers will be able to tell you have crafted a dream kitchen to many, thus increasing the value of your kitchen the day you choose to sell your home. Range hoods are especially important to include in a kitchen, because many people may also see that you do not have one and will turn and look for a home with one already installed, losing out on a potential sale of your home. Having a range hood is practically a necessity in this sense. Want To Give your Kitchen a New Look? Call the J.F. Johnson Lumber Company Today! With two locations across Maryland, the J.F Johnson Lumber Company is here to assist with all of your home remodeling needs. We install everything from cabinets, sinks, and countertops to outdoor decks and doors, using only the best hardware and materials to do so. If you’re looking to remodel your home, you have come to the right place. We have been dedicated to providing our best service and products across Maryland for almost 100 years now and we are ready to help you build your dream home. For more information regarding our products and services, please contact us or pay us a visit! Our Millersville and Edgewater locations are open Monday-Friday from 6:30am-4:30pm and Saturday from 8am-1pm. To contact our Millersville store, call 410-987-5200. Our Edgewater location can be contacted at 410-956-0400. Also, feel free to follow us on Facebook and Twitter for more updates. This entry was posted on Friday, March 9th, 2018 at 2:09 pm. Both comments and pings are currently closed.